Changes to the way Operation Stack is carried out on the M20 in Kent will come into force over Easter. The operation, where cross-Channel lorries queue to get into Dover, was re-implemented between junctions 11 and 12 of the M20 on Thursday afternoon. The new system will be put into practice if Operation Stack is required again over the holiday weekend. 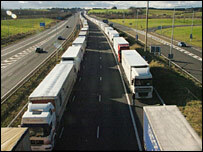 It would see a two-way contraflow between junctions eight and nine on the London-bound carriageway of the M20. Coastbound traffic that is not part of the Stack operation will use the London-bound lane. Previously, lorries were kept on the M20 and other traffic was diverted onto the A20. The London-bound carriageway remained unaffected with traffic in that direction continuing to run. Kent Police, the county council and local residents and businesses have felt the complete blocking of the coastbound carriageway and the diversions onto the A20 have had too big an impact on the local area. The new system will affect traffic heading in both directions, but will also leave part of the M20 clear for traffic heading both ways. Kent Police's Assistant Chief Constable, Dave Ainsworth, said: "People will be travelling to see friends and family over the Easter holiday and we hope this new plan will minimise disruption to motorists." But he urged drivers to allow extra time for their journeys or to consider using the A2 or M2 as an alternative route to Dover.